After hearing "Your Body Is A Wonderland" time and time (and time) again, you're probably growing weary of the mid-twenties singer-songwriter act. But fear not. Some still have a unique sound. 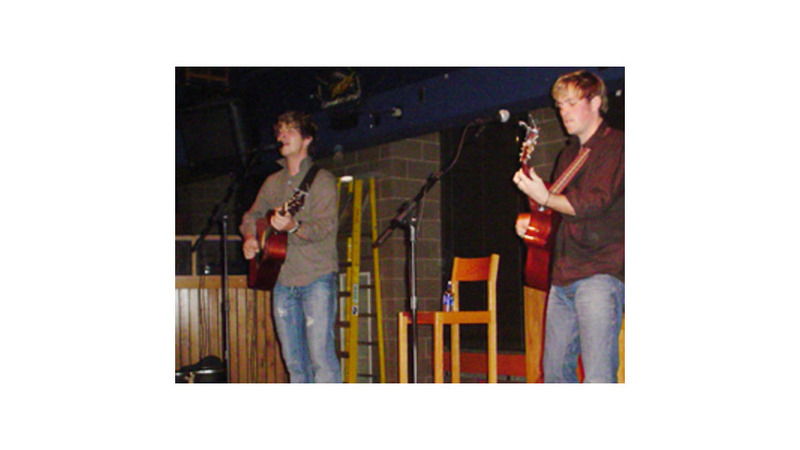 The newest of the new breed of heartthrobs go by the names Dave Barnes and Matt Wertz, and both appear to be riding comfortably down the road John Mayer has so gracefully paved for them over the last two years. Barnes (photo right) and Wertz (photo left) sold out Eddie's Attic in Atlanta, and inside it's impossible to find a seat. As I squeeze into a nook next to the door, the 25-year-old Barnes takes the stage with only his acoustic in hand. While the crowd members continue to chat amongst themselves, he sweeps his shaggy blond hair out of his face, quietly introduces himself, and sets into his first two songs, which are admittedly much more blues-driven than his preppy button-down-and-jeans getup would suggest. Mid-way through Barnes’ set, the crowd begins to really listen. He launches into "The L.A. Song," which he says he wrote about a friend. After botching the lyrics, he sheepishly grins, takes a jab at himself, and earns the audience’s attention the second time around. The chorus is especially catchy: "He uses love like a bullet from a gun / She's careful like a surgeon / Everywhere he goes they all know to run / But she can’t help but love him." Barnes' songs are slow, melodic, and clearly influenced by his Mississippi rhythm-and-blues roots. He’s on the same road as his singer-songwriter counterparts, but he gives himself a little more license at the wheel. Long-time friend Matt Wertz joins him onstage for a few numbers and, suddenly, life is injected into the audience. The two musicians join forces on a few fast-paced numbers and comical faux-rock-star moments, including Wertz’ unsuccessful attempt to impersonate the archetypal hair-band rocker with one foot on the speaker and his head banging to the melodic acoustic music they’re playing. It's refreshing to see they don’t take themselves too seriously. After Wertz leaves the stage, Barnes finishes his set with "Grace's Amazing Hands," a song immediately reminiscent of Ben Harper, thanks to the off-beat, but mesmerizing finger picking. Barnes wins over crowds with his husky voice, too. It has more soul than most artists in his genre, whose breathy songs tend to lower the average age of their fans. Wertz—wavy blond-hair hanging in his eyes—takes the stage again, but this time alone. He immediately breaks into a fast-paced tune that doesn’t stray far from the Mayer mold. And since Mayer got his start at Eddie's Attic, while watching Wertz play tonight you can easily imagine what it must have been like to see Mayer here four years ago. Wertz acknowledges his genre’s age-old attempts at writing the song about life. "Every singer-songwriter has to have the song about the Quest," he says before launching into his own Quest song, "Counting to 100." Wertz also refers to the quintessential breakup song and love song, both of which he sings for us tonight. But he’s not all show. His brooding side comes through on “Wesley, Why” which he wrote while coping with his grandfather’s death. The two up-and-comers finish the show standing in front of the audience, out of the spotlight and without amplification, Wertz quietly singing “Red Meets Blue.” The song contains the lyric, “I want to see all of you,” which sounds eerie as the words float amidst the hypnotized crowd. As the final note slowly fades and the two walk off stage, there is much applause, and they graciously thank fans as they make their way to the back door. Both men already have the respect of their peers. Wertz, a Missouri native, played some shows with singer/songwriter Gavin DeGraw in April, and Barnes has sung backup for less-mainstream artists like Justin Rosolino. Together Barnes and Wertz were entertaining and amusing, quick to take playful shots at each other, and even quicker to make fun of themselves and the elusive “rock stardom” neither has yet to achieve.